Kutaisi was the capital of the ancient Kingdom of Colchis. Archaeological evidence indicates that the city functioned as the capital of the kingdom of Colchis in the sixth to fifth centuries BC. Several historians[who?] believe that, in Argonautica, a Greek epic poem about Jason and the Argonauts and their journey to Colchis, author Apollonius Rhodius considered Kutaisi their final destination as well as the residence of King Aeëtes. From 978 to 1122 CE, Kutaisi was the capital of the united Kingdom of Georgia, and from the 15th century until 1810, it was the capital of the Imeretian Kingdom. In 1508, the city was captured by Selim I, who was the son of Bayezid II, the sultan of the Ottoman Empire. Finally, the Russian-Turkish wars ended in 1810 with the annexation of the Imeretian Kingdom by the Russian Empire. The city was the capital of the Kutais Governorate, which included much of west Georgia. In March 1879, the city was the site of a blood- libel trial that attracted attention all over Russia; the ten accused Jews were acquitted. Kutaisi was a major industrial center before Georgia's independence in 1991. 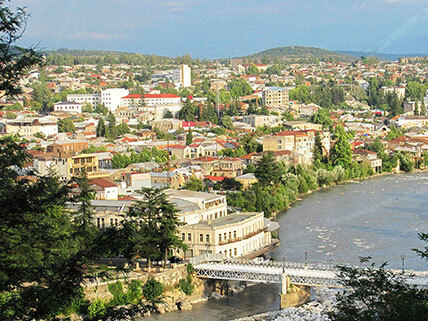 Independence was followed by the economic collapse of the country, and, as a result, many inhabitants of Kutaisi have had to work abroad. Small-scale trade prevails among the rest of the population. The landmark of the city is the ruined Bagrati Cathedral, built by Bagrat III, king of Georgia, in the early 11th century. The Bagrati Cathedral, and the Gelati Monastery a few km east of the city, are UNESCO World Heritage Sites. One of the famous churches in Georgia is Motsameta Church. It is named after two saints, brothers David and Constantine. They were the Dukes of Margveti, and were martyred by Arab invaders in the 8th century. Besides the churches, there are many interesting places in Kutaisi, such as: Sataplia Cave, where one can observe footprints of dinosaurs; Geguti Palace, which was one of the residences of Georgian monarchs; "Okros Chardakhi" – Georgian Kings’ Palace; and the Pantheon, where many notable citizens are buried.